A morning collection of links and comments about my home, California. Just days after Marco Rubio’s election as Florida’s newest Republican U.S. senator, former First Lady Nancy Reagan wrote to him, asking him to speak at her husband’s presidential library. Rubio will officially be someone to watch on Tuesday, when he travels to California for his first major speech outside of Florida or the U.S. Senate — as well as some fundraising for his just-launched political action committee. He’s expected to expound on a familiar theme of his own and Reagan’s at the former president’s library: the role of government in America. Nearly 70 people gathered Sunday for a protest rally at the Ventura Youth Correctional Facility in Camarillo. Chanting “Books not bars! Schools not jails!” those who attended came from across the state, hoping to bring attention to abuses they say are occurring within the facility. Jaime Barillas said his 18-year-old son has been beaten by guards and had chemicals sprayed in his face. Barillas’s eyes welled up with tears as he explained how his son’s problems began when Barillas and his wife got divorced and the boy started hanging with a bad crowd. “He’s been here the last eight months,” he said. Barillas and others in attendance believe the state’s Division of Juvenile Justice is profiting by keeping youths incarcerated for longer than they should be. “Every time he gets close to getting out of there something happens” to keep him locked up, Barillas said. Diazdelon spent two years incarcerated in DJJ institutions in Northern California. He said he initially was sent to one after an attempted burglary in Fresno County. Now he said he works as a youth justice educator and speaks with lawmakers about the system. California’s unemployment rate remains the second-highest in the nation – 12 percent in July – but among some demographic groups, joblessness is even higher. The unemployment rate among 16- to 19-year-olds in California was 34.2 percent last month, according to the state’s analysis of federal data [PDF]. That’s down from 34.5 percent a month earlier and 34.8 percent a year ago. For non-white workers, unemployment over the past year has increased, from 12.4 percent to 13.4 percent. Whereas 11.6 percent of whites were out of work in July, 14.3 percent of Hispanics and 20.3 percent of blacks were unemployed. While the unemployment rate in California is higher among men than women, over the past year, it has improved more for men than it has for women: Between July 2010 and July 2011, the unemployment rate among men fell from 13 percent to 12.5 percent. Among women, unemployment rose from 11 to 11.4 percent during the same time. Many of the jobless Californians counted a year ago still are unemployed today: Slightly more than 1 in 3 – 727,000 people in all – have been out of work 52 weeks or more. Over the past year, the number of people unemployed a year or more grew 18.8 percent. Unemployed workers are eligible for up to 99 weeks of jobless benefits. As of Aug. 16, the number of Californians who had exhausted all their benefits is more than 497,000, according to the state Employment Development Department. Members of a union that represents 62,000 grocery workers at Vons, Ralphs and Albertsons supermarkets in Southern California voted overwhelmingly to authorize a strike if an agreement on a new contract can’t be reached. The strike authorization won the backing of more than 90% of the United Food and Commercial Workers members who voted, easily more than the two-thirds majority required, the union said. The union said it would report the vote results Monday to a federal mediator trying to resolve the contract dispute. Since the latest contract governing wages, healthcare benefits, and workplace rules expired in March. union and management negotiators have met more than 53 times. Healthcare benefits are a major area of contention. Both sides said they would like to avoid a repeat of a four-and-a-half-month strike and lockout in 2003. In a statement, Ralphs spokeswoman Kendra M. Doyel called the strike authorization a commonly used negotiating tactic and said it did not necessarily mean a strike would be called. “Ralphs, Vons and Albertsons remain committed to reaching a contract that is good for our employees and keeps these union jobs sustainable for the future.” Doyel said. The Librarians should be glad they are not being replaced with a PC, i-Pad and Google. A beast is on the loose at the Capitol today — and we’re not talking about Sutter Brown. A “privatization beast” will be roaming Capitol Park as librarians gather on the south steps to warn of what they say are the perils of privatizing public libraries across the state. The 2 p.m. presser is being staged in support of Assembly Bill 438, a union-backed bill that would establish a series of hurdles for cities and counties looking to hand over their library operations to private companies. Several California libraries have already signed on with a national contractor called Library Systems & Services. The bill, by Democratic Assemblyman Das Williams, passed the Assembly on a 44-28 vote and is currently awaiting floor action in the state Senate. Supporters argue privatizing libraries can result in added fees for users and restrict access to services, while opponents say making privatization more difficult would hinder local governments’ abilities to make cost-saving decisions. Dilbert August 21, 2011 – Horrible Issue? Finally. I mean, what had to happen an airplane crash? For nearly a year, officials have been trying to figure out what to do with Charles Douglas. The 59-year-old owner of Precise Roofing Company in Burbank has been feeding flocks of pigeons since at least September 2010, officials say, which — beyond violating municipal code — has created a major safety hazard for jet airplanes using the nearby Bob Hope Airport as the birds numbers have grown into the hundreds. On average, airport police Commander Allen Schmitt said planes at Bob Hope Airport strike a bird once every two months. But the rate of strikes has increased recently to five incidents in July alone, he added. In July, a Southwest Airlines flight was diverted to Ontario after it flew into 20 to 30 pigeons during takeoff, he said. 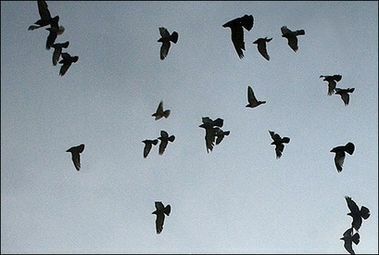 “A pigeon is not a problem, but a flock — that’s a problem,” he said. On Friday, after two court citations and a bench warrant for feeding the pigeons, Burbank police arrested Douglas at his business on Hollywood Way and Tulare Avenue. This guy definitely has some psychological problems and why the Burbank Police waited so long is beyond me – especially since I fly out of Bob Hope Airport. Lock him away for about 6 months in the Los Angeles County jail and I bet he will stop.